Debbie won 7 night dive package at El Galleon Beach Resort in Puerto Galera, Philippines! The Story: On the first day of the dive trip, we decided to dive the wreck of the Caribsea off of Morehead City, North Carolina. When we arrived at the site, the visibility did not appear to be the best, but we decided to dive anyway. During the descent, the water appeared darker than usual, however, the deeper we descended, to our amazement we encountered a massive bait ball just above the shipwreck. 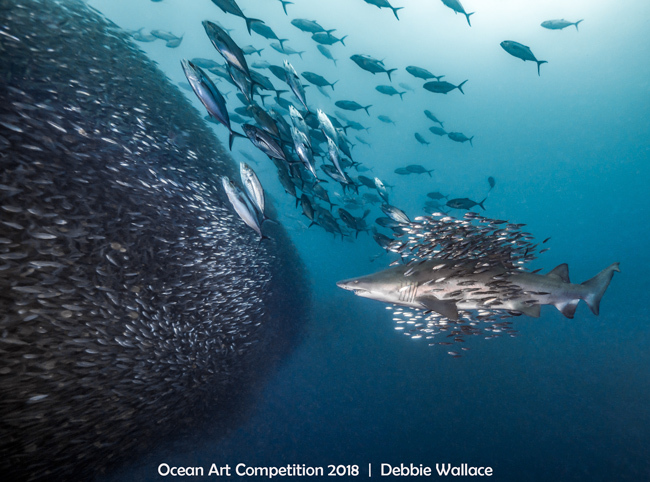 Upon further inspection, there were a multitude of sand tiger sharks entering and exiting the bait ball in a calm, peaceful manner, seemingly more curious than hungry. As I slowly and cautiously watched, I saw this large female sand tiger shark with her own bait ball entourage just approaching the massive ball. I was mesmerized by the entire scene but my brain quickly engaged enough to set up for the shot of her about to enter. She seemed completely disinterested in me and continued her journey. As I waited for just the right time, I was rewarded with this image.